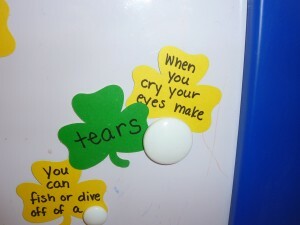 Most speech pathologists will send home practice pages with words that have the target sound for the child to work on. If they do not, contact them and let them know that you would like to reinforce what they are doing and would like to stay current on the sounds your child needs to practice. This is particularly helpful if they receive services while they are at school and you are not able to speak with the pathologist each time. Andrew receives his speech therapy after school so I am there and ask his speech pathologist what we should be working on or I look at the homework paper he gets for practice. While I do not use the homework sheet as she does while working with him, I do take the words and/or sounds and turn them into more of a game. I Need To Help My Child Practice Skills But They Don’t Want To Work With Me! One of the reasons I came up with My Obstacle Course is that he didn’t want to work with me and I know I am not alone in this because I hear it ALL of the time. We would come home from our speech session armed with a sheet of pictures that had the sound he was working on and we were expected to practice this. I don’t know about you, but in my house it looked and felt as though I was trying to wrangle an octopus into a sleeping bag. He wriggled, he yelled, he ran around the room, he would spin things all while I looked for ways to bribe him. Ah, bribery. Then one day I had enough and thought, “This is miserable! There has to be another way! 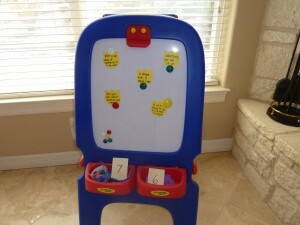 !” And there was…by turning it into a game or station activity played within My Obstacle Course. This helped tremendously because it was part of a larger structure, it had a beginning and an end and he knew what was expected. It also helped because while I made the activities, it wasn’t coming from me, it was just part of the Obstacle Course. Match the word with its clue and then say the word 5 times. Read the clue and find the word that goes with it. Say the word 5 or 10 times. 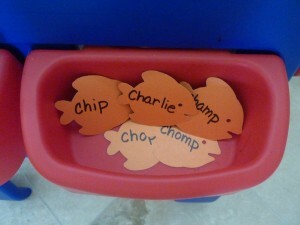 Clues for words with the /air/ and /ear/ sounds, like "chair, care, share" and "hear, deer, tear, clear." Word matched up with its clue. 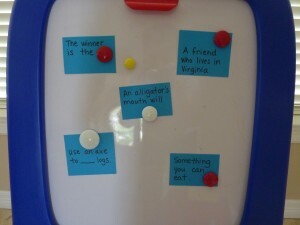 Clues for words beginning with /ch/. Here are the /ch/ words that he was working on. 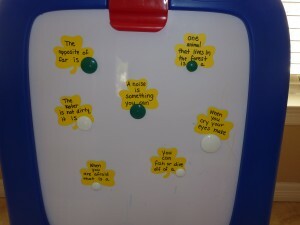 I really like doing this on the magnetic easel because it is also working on fine motor skills and planning because he has to hold the clue, lift the magnet and slide the word underneath so they are all held on to the surface with the magnet. It does not take long to make this activity but it makes it so much more fun for both of us to reinforce his speech pathologist.